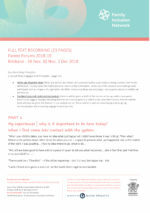 In late 2018, Family Inclusion Network (FIN) invited parents to small forums to discuss developing a permanent mechanism to engage with the Queensland Department of Child Safety, Youth and Women. More Parent Forums are being planned for 2019. Feel free to contact us if you have an interest in future forums, or in becoming a member of FIN. 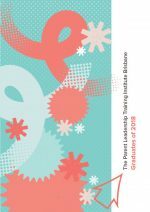 Earlier in 2018, the Honourable Di Farmer MP, Minister for Child Safety, Youth and Women, and Minister for the Prevention of Family and Domestic Violence made an Australian-first announcement: "We are committed to working with parents in developing the policies for this department..."
The 2018 Parent Leadership Training Institute (PLTI) graduates book gives an outline of classes completed during the training and celebrates the parent projects presented during the second PLTI program in Brisbane. Since completing Parent Leadership Training, these parents continue on their leadership journeys and continue to influence change in their families and communities. Feel free to contact us if you have an interest in any of the projects listed or if you would like to mentor emerging parent leaders in future classes. This report has been written for DHHS workers, NDIS workers, families, health workers, disability workers, advocates and anyone interested in the rights of parents with an intellectual disability. 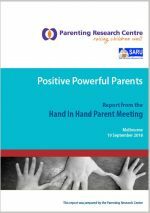 "This report shares our stories so that people know what is happening to parents with intellectual disability. It is a true reflection of parents’ lived experiences. We want the community to know that parents with an intellectual disability can be good parents when they have the support they need." "When parents with intellectual disability come together we help each other and we try to change the way child protection sees us." We facilitate opportunities for parents and kin to be advocates for children and themselves on issues that affect their lives. 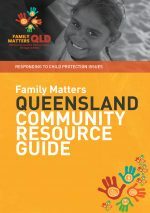 The Family Matters Community Resource kits were developed in 2018 by SNAICC – National Voice for Our Children, in close consultation with Aboriginal and Torres Strait Islander leaders, community-controlled organisations and campaign committees in all Australian jurisdictions. What are the problems with the child protection system? What are the solutions we need? What action can you and your community take? This fellowship has explored a range of initiatives and programs that aim to build a family inclusive approach to child protection and out of home care (child welfare) practice especially when children have been removed by statutory child welfare agencies and placed in care. 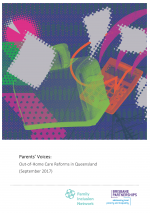 This report and its recommendations have been prepared by the Brisbane Partnerships (a partnership between Kyabra, Micah Projects, the Community Living Association and Jabiru) and the Family Inclusion Network SEQ. We welcome the opportunity to work with the Department of Communities, Child Safety and Disability Services, in their review of out-of-home care for children, with this contribution on the views of birth parents. 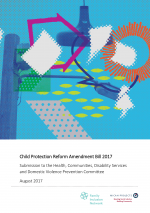 Micah Projects and the Family Inclusion Network welcome the opportunity to provide this submission to the Health, Communities, Disability Services and Domestic Violence Prevention Committee regarding the Child Protection Reform Amendment Bill 2017. Introducing the Parent Leadership Training Institute (PLTI) and its 2016 inaugural graduates! The participants took part in the 2016 pilot program, encouraging each other to act on issues that impact their families and to become leaders in their communities. They now have the skills and knowledge to influence issues and policies that affect their families, from neighbourhood to state level. 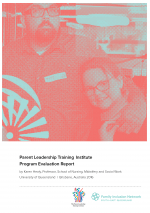 Parent Leadership Training is run in partnership with the Parent Leadership Training Institute (PLTI) from Connecticut US and the Family Inclusion Network SEQ. The Family Inclusion Network – South East Queensland (FIN SEQ) operating under the auspices of Micah Projects conducted a Parent Leadership training initiative in Brisbane. The pilot operated over a 15 week period between August 28, 2016 and November 30, 2016. At the commencement of the program participants were asked to complete a survey and at the completion of the program, participants were asked to complete a ‘post’ survey. This analysis focuses on a comparison of the pre and post surveys.